It is a ideal vertical planter for units,balconies and small spaces. With the unique design,it also could become a household vertical plant wall.The water flow system will nourish your plants all time, no matter how many garden walls you have it connected in the system. User don't need to worry about power supply,only simply pours the water in and water will circulate throughout the system. 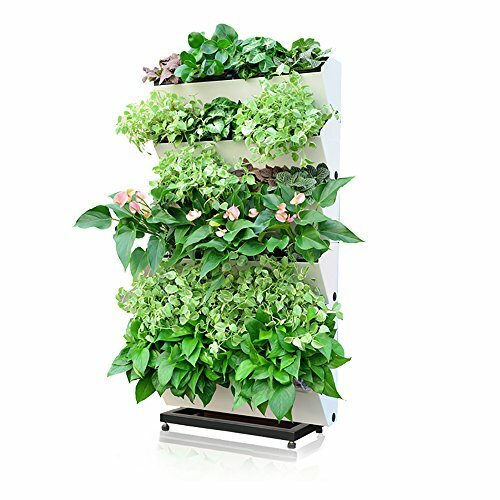 The product can be stand-along or connected horizontally and vertically to form a "vertical garden". If you don't want to drill holes on your wall,our stand set could help you solve it.One set incloud 6 planter and 1 mobile stand. Irrigation Hole: Remove the top stopper and slowly fill the resevoir;Approximate weight if single planter when full is 6.8kg. Water Level Indicator: The water level indicator stem should rise as the water level rises;stop watering when the indicator reaches full. Drainage Piston: If the product was located where is susceptible to frequent rainfull,we recommend removing the red stopper on the last planter,as illustrated above,to prevent the unit from overflowing. Cyclic Irrigation: Walls water flow system circulates throughout no matter how many vertical gardens you connect,all the time nourrishing your plants. Body Reinforce: Two additianal base can help planter stand alone on the floor,table or windowsill. If you have any questions about this product by Green Sun, contact us by completing and submitting the form below. If you are looking for a specif part number, please include it with your message. Le Present J320 Stainless Steel Flute44; Mirror44; Mirror - 55 x 12 x 12 in.